When the True Guru is merciful, you will enjoy the Lord’s Love. When the True Guru is merciful, you shall be absorbed in the True Lord. This entry was posted in Shabad Kirtan and tagged Dayal, Gurbani Sangeet, Gurmat Gian Group, Gurmat Sangeet, Gurpreet Kaur, Japjit Kaur, Keerat Kaur, Keertan, Kirtan, Satgur, Satguru, Shabad, Shabad Kirtan, Sharda. Bookmark the permalink. I listened lot of their tracks.I have no words to describe how beautifully all of the tracks were sung and I felt I was in another world,Is there any way that they can come to Canada and we can see them singing live these beautiful hymns. 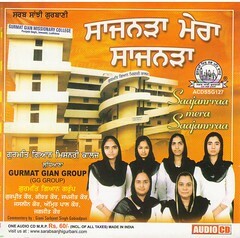 it’s really inspiring to see our sisters and mothers reciting gurbani in a beautifull inspirational manner it seems that we are seeing the souls of great mothers who have put body pieces of their children on their neck but always recited and lived their lives according to gurmat, my head now is held high after seeing this website of our khalsa sisters. Every shabad is marvelous,no word to praise; this is the “dhur ki ayee baani”. Waheguru ji ka khalsa Waheguru ji ki fateh to all of you and the listners too. I have the bakhshish and m thankful of my AKALPURKH WAHEGURUJI that he has blessed me with the ability of being a “shrota” (listener) and reach the kirtanias who recite “Gurbani ka Gayan” with Man, in other words those who have so called ” Bani Sodhi Hoi hai”. You all are blessed people, and for me you are GURU KE WAZIRS. I pray to Waheguru to shower his choicest of blessing on you all, Dr. Manbir Singh, Rana Ji, Bibi Gurpreet kaur and others. Thanks for giving us such a soulful, melodious, rag-riched Gurbani. May i look- forward to listen to u live, based in New Delhi, but distance or travelling for this purpose is no constrain. I have tried to locate the CDs in Delhi but have not been able to. Can u give me the source in Delhi otherwise i will be buying on line from u. 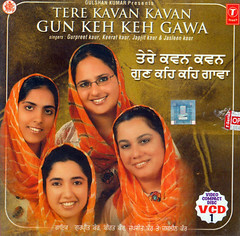 The CDs i have selected r Tere Kavan Kavan Gun, Mera Vaid and Priya kee Preet. 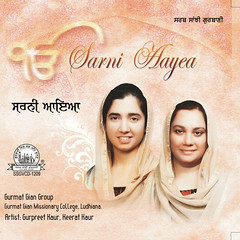 Gur Fateh Maninder Singh & Mohanjit Kaur ji. We are honored to have you as part of our cyber sangat. We would keep trying to post Gurbani Kirtan here on this site so as to spread the fragrance of Guru’s Bani all over the world. In this endeavor we seek Waheguru’s Blessings. I very rarely take up stage programs. Whenever there is an occasion to do keertan near your city I would try to inform you. I agree it may not be easy to get our CDs as we do not promote them commercially. Do intimate me the cds you wish to have and I would send them through courier. 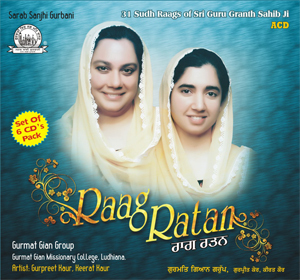 Just to add; After my last album “Raag Ratan”, these days I am working on a new Album which is on All the forms of Raag Gauri in Sri Guru Granth Sahib ji. There are 12 forms of Raag Gauri like Gauri guararee, Guri bairagan, Gauri cheti, Gauri deepki, Gauri poorbi deepki etc etc… Hope to release this Album early next year. Do keep visiting this Blog as we keep adding new shabads frequently. 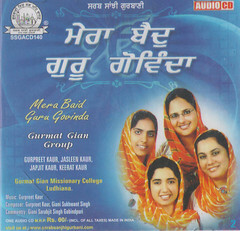 Mukesh ji, it is heartening to know that this Gurbani Shabad sung by Gurpreet and her students has touched you. When Almighty himself showers blessings we feel like in heaven. 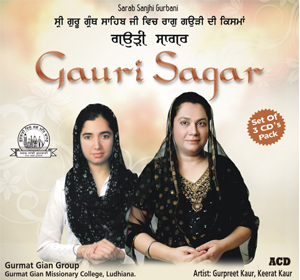 Visit Gurpreet Kaur’s Facebook Page for many more Gurbani Shabads.